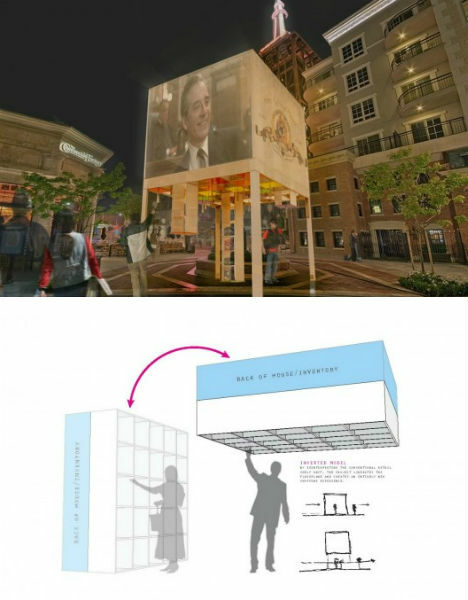 Popping up in unexpected places overnight, temporary retail locations aim to dazzle shoppers with engaging visuals and alluring merchandise displays. They take over vacant storefronts, unfold from nondescript boxes or appear in the form of tents and igloos, giving shoppers an unexpected look at goods from big-name brands and small designers alike, taken outside the confines of cold and impersonal conventional shops. 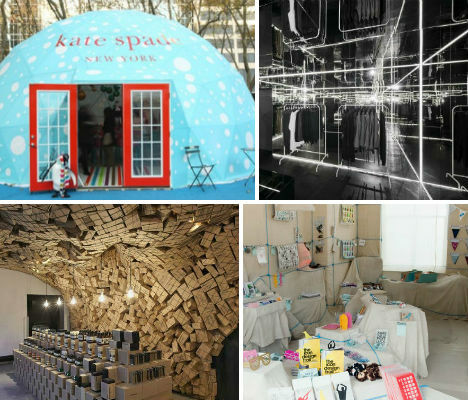 These 14 pop-up shops stand out for their ingenuity, making it nearly impossible to pass without taking a peek. From the outside, it’s a diminutive box. But step through the door, and you’ll find an interior that seems to go on and on forever, thanks to some clever tricks with mirrors and strips of LED lighting. 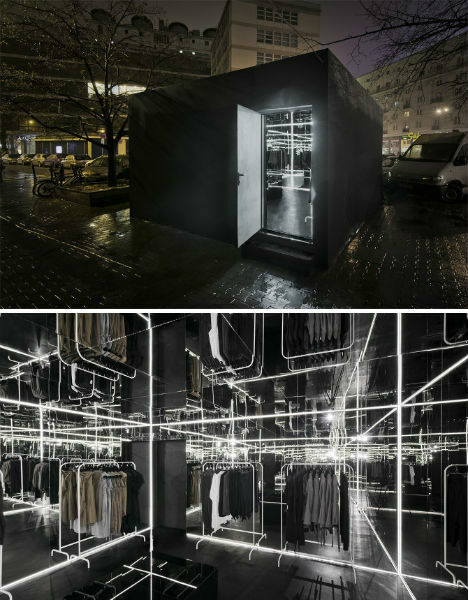 The Zuo Corp. pop-up shop in Warsaw, designed by Polish architects Super Super and Inside/Outside, seems to transport visitors into another world altogether. Australian skin care brand Aesop really knows how to wow their customers with the interior design in both their permanent retail locations and in their pop-up shops. 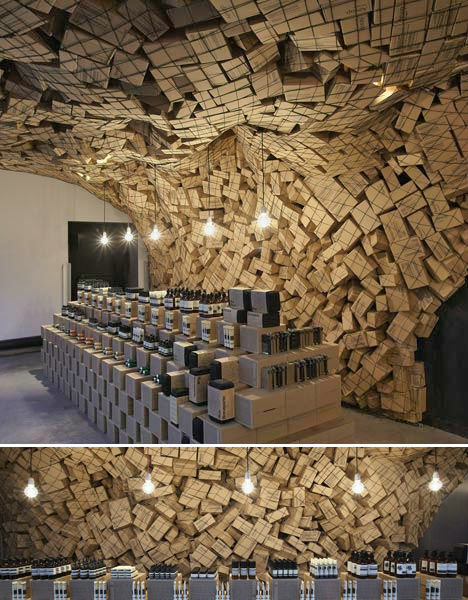 This temporary shop designed by March Studio, located at Singapore’s Merci in January 2011, made a big impact with a gigantic installation of cardboard boxes suspended in a net. 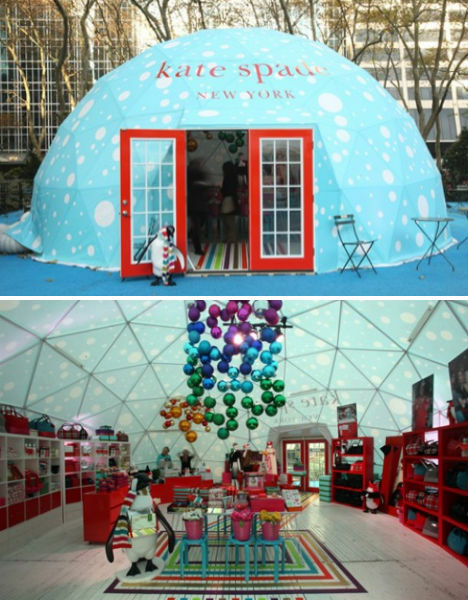 It would have been hard to walk by this igloo-shaped pop-up shop in New York’s Bryant Park in December 2010 without taking a glance at the interior – especially if you’re a fan of brand Kate Spade. Located next to the park’s Citi Pond skating rink,the igloo offered a range of goods from $8 stocking stuffers to $495 luxury handbags, not to mention free cups of cocoa. Do you recognize the items that are stretched like rubber bands all around the inside of this temporary Arnsdorf concept store? 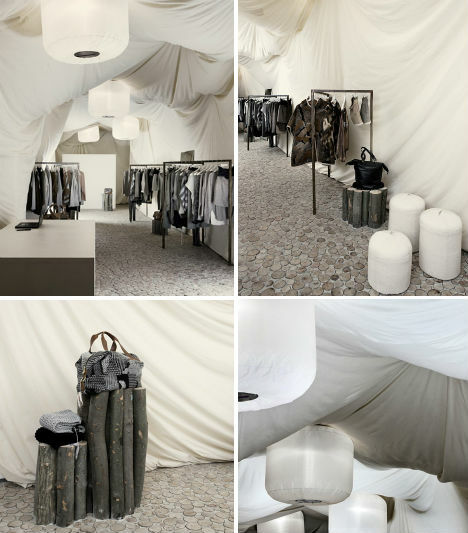 Design firm Edwards Moore took inspiration from crystalline forms and rocky landscapes to create these slightly surreal space, which is filled with dozens of pairs of pantyhose in muted neutral colors that matched the shop’s offerings. 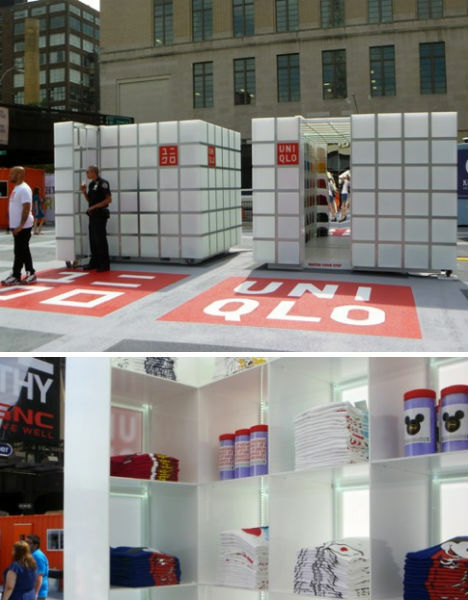 Japanese fashion brand UNIQLO has been getting a lot of attention for its innovative cube-shaped pop-up shops, which have been sprouting up all over Manhattan. In fact, several of the shops took center stage at a Uniqlo-sponsored roller skating rink on the High Line, with one offering the brand’s signature cashmere sweaters and another hawking colorful t-shirts. 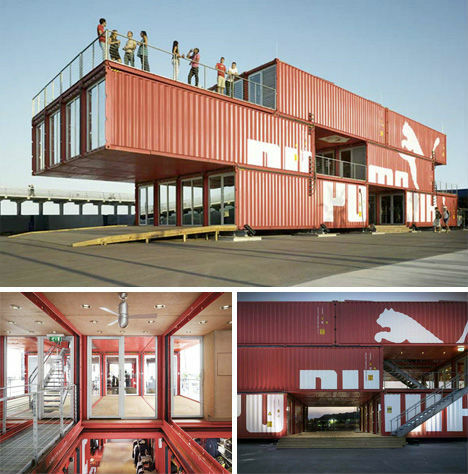 24 shipping containers came together to create Puma’s incredible mobile pop-up shop, which measures 11,000 square feet and travels around the world on cargo ships. Puma City was built for the 2008 Volvo Ocean Race and remains one of the most complex and eco-friendly pop-up shops we’ve seen. Gap teamed up with the website Cool Hunting to create a pop-up shop filled with the kind of fascinating curiosities you see on Cool Hunting’s pages every day. 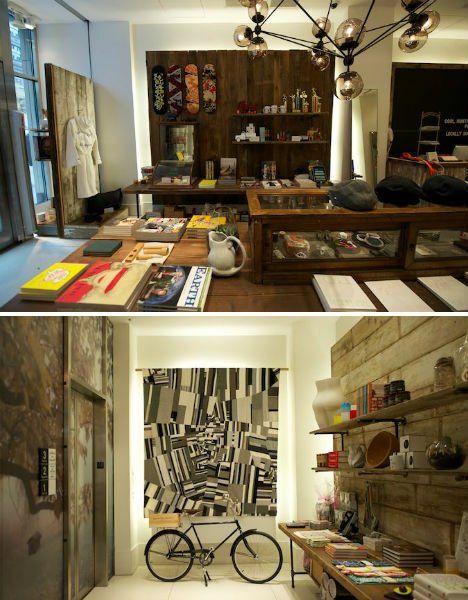 The shop was set into Gap’s project space on 5th Avenue in New York and contained hundreds of items hand-picked by the site’s editors including designs by Jonathon Adler, a limited-edition Mast Brothers chocolate bar and an Outlier cycling cap. It closed in January 2011. 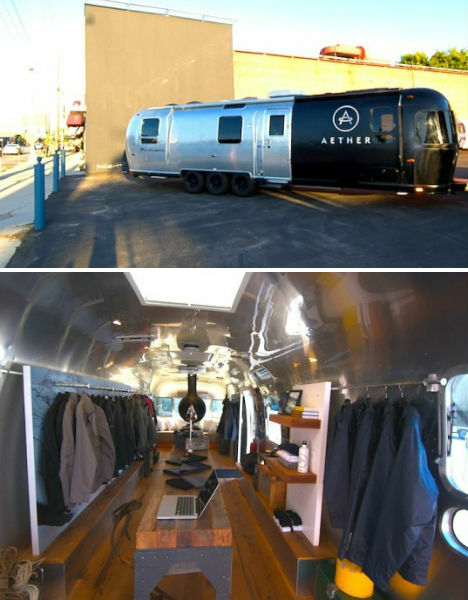 The AESTHERstream is a converted 34-foot Airstream trailer carrying men’s fashion and decorative items. Two movie producers came up with the idea for “the ultimate guy’s workshop, an adventure lab on wheels, a mobile man cave.” They hired designer Thierry Gaugain to outfit the interior with reclaimed wood floors, modular shelving and vintage details. 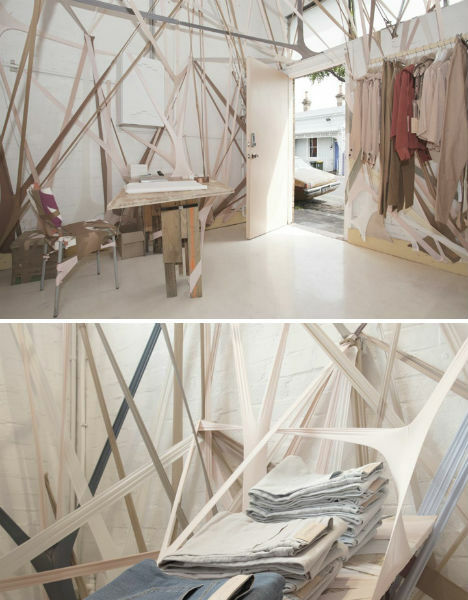 Dust sheets, nylon rope and white paint allowed designer Asif Khan to transform a temporarily uninhabited storefront for London Design Festival 2010. 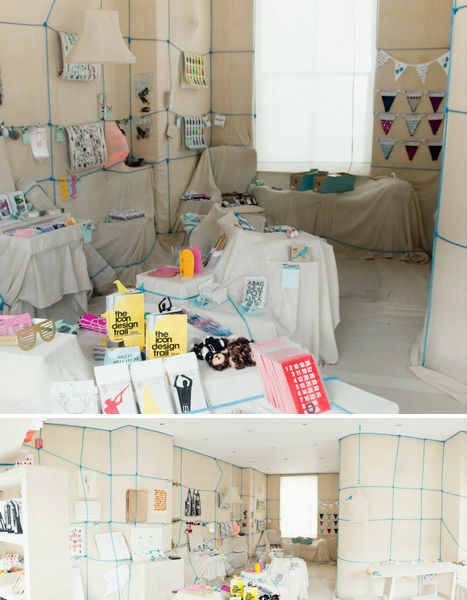 Poundshop was a collaboration between design collective Household and illustrator Sara Melin; beneath those dust sheets was furniture from the organizer’s own home. The shop interior was completed on a budget of just 250 pounds. 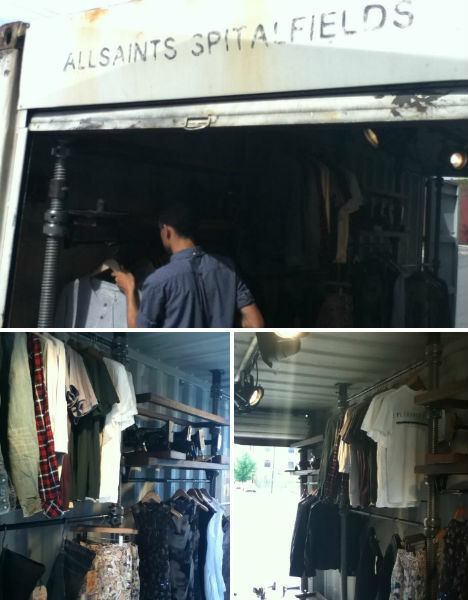 Edgy British brand AllSaints brought their post-apocalyptic aesthetic on the go in a fittingly banged-up, partially rusted shipping container. The pop-up shop appeared on Chicago’s Michigan Avenue in July 2011 to celebrate the opening of a new permanent retail location, and was also seen at a number of festivals and other events. 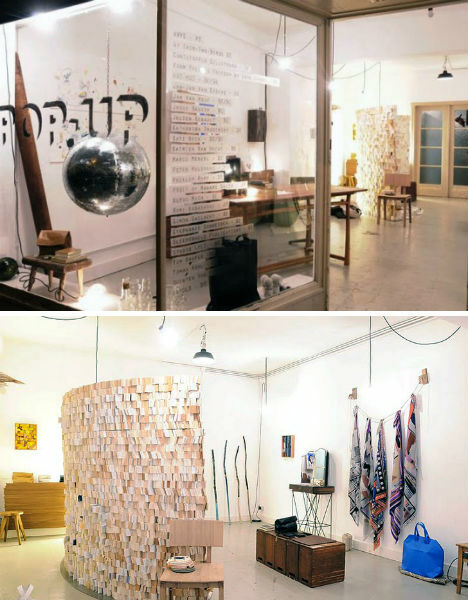 A pop-up shop in a former solar panel retail storefront also serves as the headquarters for design collective Atelier Solarshop (named, of course, in tribute to the site’s former use.) The designs and products on display in this Antwerp, Belgium shop are made using found and recycled materials including scrap paper and tree branches. A thoughtful collection of eco-friendly goods comes together in ‘Our Eco Shop’, a temporary store located in London. 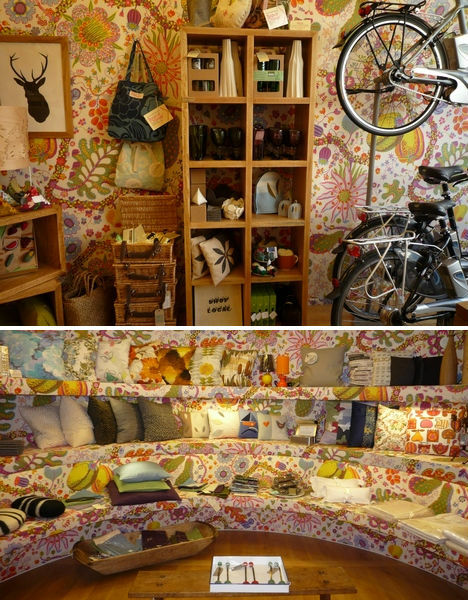 The store features products from over 40 UK designers-makers and small green companies including envelopes made out of old maps, reusable shopping bags, make-up cases, bicycles, pillows and scarves.